Norma Jean Christensen passed on to eternal life on September 26, 2018. She was born August 13, 1937 in a log cabin on the Holmberg ranch to Bud (Norman) and Lena (Smith) Holmberg, before the doctor could get there. The oldest of four children, she grew up in the ranch life and attended all of her school years in Melstone. A beautiful, cheery person, she married James F. Christensen in 1956. Two children were to follow, Kirt and Ronda. They hired out on surrounding ranches until they were able to purchase the Minnie place as their own in 1975. An excellent seamstress, she made clothes for her children as well as many a western shirt. She was an excellent cook and baker whose skill and hospitality took a back seat to no one. Nobody ever went away from her table hungry! Her table for special events and holidays was always set beautifully. A lady with pizazz, who could really put herself together, loved to laugh and crack little “funnies.” She taught us kids lots of ditty’s that we sang on many car trips when we were young, and even in the last days in the hospital. She loved pinochle and use to play once a week in Melstone. She loved the Lord and taught VBS and Sunday School, even taking her Sunday school class to the Passion Play in South Dakota. She spun fine wool, the most desired and hardest to spin, for the wool store in Roundup until it closed. She loved to rock hunt. An interest passed on to her children and grandchildren. She found fossils that are wonderful family treasures. Mom loved the western way of life. 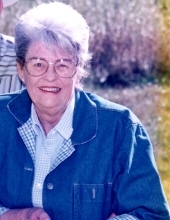 She wrote cowboy poetry and attended gatherings throughout Montana and in Idaho. She didn’t just write poetry, she took a true story and wrote a poem about it. She was published in Boots Magazine and was a participant on Lonnie Bell’s Poet’s Corner on KGHL for many years. Mom loved animals and they all took to her gentleness. She loved birds, and Dad faithfully kept her bird feeders full. She could name every specie that came to visit. But, what she REALLY loved was horses. Getting that from her dad, their family raised and broke the horses they rode. Mom trailed cattle with us often until she couldn’t because of her bad knees. She didn’t think there was no such thing as an ugly horse, which isn’t surprising, because mom found the beauty in everything. We would take our saddle horses up to the house later on, so she could step out to pet and admire them. Mom was a prayer warrior for our family. Not many visitors left her house without her telling them about Jesus. Thank you, mom, for all you have done. The family would like to thank Sunflower Gardens Assisted Living and Roundup Memorial Hospital for their understanding, compassionate care. Norma is preceded in death by parents Bud (Norman) and Lena (Smith) Holmberg, and brother Tom Holmberg. She is survived by husband Jim Christensen, son Kirt (Trish) Christensen, daughter Ronda (Greg) Seder, and grandchildren Dane, Jaret (Lauren) Christensen, Leighton and Sydni Seder and great grandchildren Caden, Daven and Haze. Funeral services will be held at Melstone Bible Church in Melstone on October 6th at 11:00 a.m. Memorials may be made to a Melstone charity of choice. Condolences may be expressed to the family at wierfuneralhome.com. To plant a tree in memory of Norma Jean Christensen, please visit our Tribute Store. "Email Address" would like to share the life celebration of Norma Jean Christensen. Click on the "link" to go to share a favorite memory or leave a condolence message for the family.